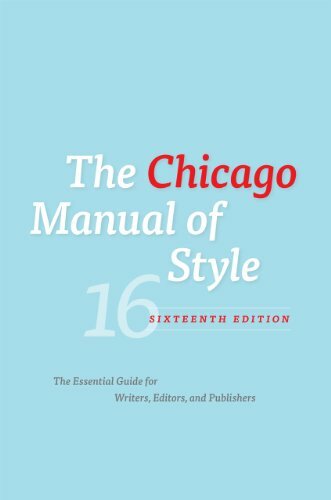 This is a quick guide to The Chicago Manual of Style (CMS) two documentation styles: the Notes-Bibliography System (NB), which is used by those in literature, history, and the arts, and the Author-Date System, which is nearly identical in content but slightly different in form and is preferred in the social/sciences. 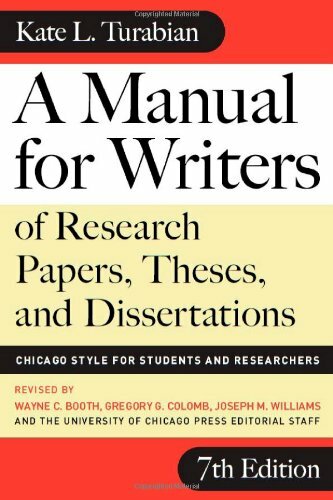 Students will also find it useful to consult Kate L. Turabian's Manual for Writers of Research Papers, Theses, and Dissertations (8th ed. ), which presents what is commonly known as the "Turabian" citation style. This style follows the two CMS patterns of documentation but offers slight modifications suited to student texts. This resource is from CMS and provides a clear and quick guide to the formatting structure of both documentation systems. This comprehensive resource from the Online Writing Lab at Purdue is very popular for good reason. It provides clear examples and descriptions of how to cite most sources in CMS 17th edition. This video from OWL Purdue goes over the basic format of both documentation styles of Chicago Manual of Style. This introductory video is from Bowling Green State University history profession Michael E. Brooks. In Notes and Bibliography, you use both footnotes and a bibliography. You indicate that you've used a source by putting a small superscript number at the end of the sentence in your text for which you've cited a source. The numbers refer to footnotes at the bottom of the page. When using footnotes, a Bibliography may also be required at the end of your paper. In some cases it may not. Check with your instructor. The global debt crisis is having a strong impact on women and children in developing nations.1 Supporting social structures continue to erode as workers must travel further for employment. 1. Audrey Bronstein, The Triple Struggle: Latin American Peasant Women (Boston: South End Press, 1982). Bronstein, Audrey. The Triple Struggle: Latin American Peasant Women. Boston: South End Press, 1982. Need More CMS Notes & Bibliography Examples? Author-Date is a parenthetical style where you include author's name, year publication, and page number (if citing specific passages) within the text of the paper. These allow your reader to find the full citation at the end of your paper in the Reference list. The global debt crisis is having a strong impact on women and children in developing nations (Bronstein 1982). Bronstein, Audrey. 1982. The triple struggle: Latin American peasant women. Boston, South End Press. Keen argues that "the Web 2.0 revolution is really delivering superficial observations of the world around us" (2007, 16). Keen, Andrew. 2007. The cult of the amateur: How today's internet is killing our culture. New York, Doubleday. Bronstein (1982) argues that the global debt crisis is having a strong impact on women and children in developing nations. Need More CMS Author-Date Examples?